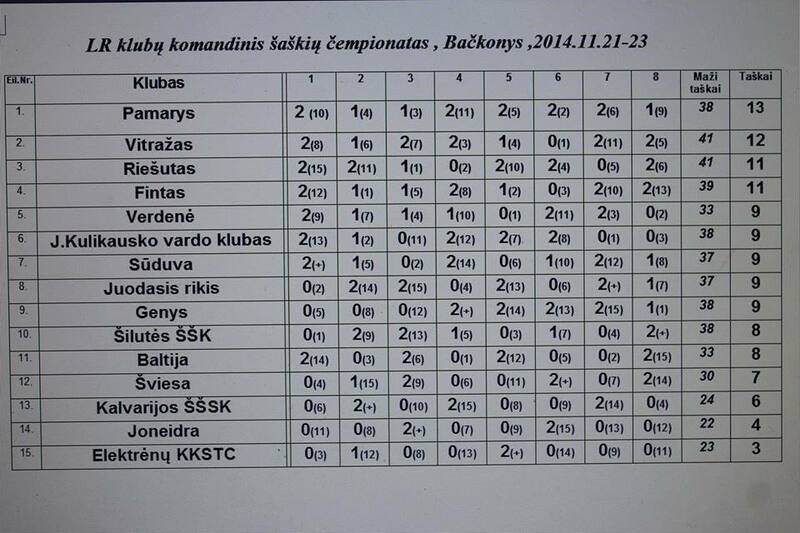 Club championship of Lithuania on the classic Russian draughts was held from 21 to 23 November 2014 in Bačkonys (Lithuania). Championship collects all the strongest players and is considered the largest draughts event in Lithuania. Championship was held in 8 rounds, micro-matches, time control 30 min + 5 sec per move. 15 teams from all over the country participated. The team with the highest average rating – ISK “Pamarys” (Klaipeda) won. Composition of the team-winner: GMI Kybartas Andrius, NGM Norvaišas Arūnas, Valužis Ričardas, Buivydas Jonas, Gricius Saulius. The team “Vitražas” (Siauliai) took second place. Composition: NGM Sigitas Smaidrys, MI Domantas Norkus, Sandra Laurutienė, Edmundas Starkus, Regina Pironen. Capital team “Riešutas” (Vilnius) took third place. Composition: GMI Aleksej Domčev, Vaidas Puočiauskas, Virgilijus Žutautas, Liutauras Šulga, Žilvinas Mieldažys, Valius Karalius. It is worth mentioning that the team ISK “Pamarys” becomes champion for the third year in a row.